This is “Interest Rate Parity”, chapter 5 from the book Policy and Theory of International Finance (v. 1.0). For details on it (including licensing), click here. Interest rate parity is one of the most important theories in international finance because it is probably the best way to explain how exchange rate values are determined and why they fluctuate as they do. Most of the international currency exchanges occur for investment purposes, and therefore understanding the prime motivations for international investment is critical. The chapter applies the rate of return formula developed in Chapter 4 "Foreign Exchange Markets and Rates of Return" and shows how changes in the determinants of the rate of return on assets affect investor behavior on the foreign exchange market, which in turn affects the value of the exchange rate. The model is described in two different ways: first, using simple supply and demand curves; and second, using a rate of return diagram that will be used later with the development of a more elaborate macro model of the economy. Define the interest rate parity condition. Learn the asset approach to exchange rate determination. Interest rate parity (IRP)A condition in which the rates of return on comparable assets in two countries are equal. is a theory used to explain the value and movements of exchange rates. It is also known as the asset approach to exchange rate determination. The interest rate parity theoryA theory of exchange rate determination based on investor motivations in which equilibrium is described by the interest rate parity condition. assumes that the actions of international investors—motivated by cross-country differences in rates of return on comparable assets—induce changes in the spot exchange rate. In another vein, IRP suggests that transactions on a country’s financial account affect the value of the exchange rate on the foreign exchange (Forex) market. This contrasts with the purchasing power parity theory, which assumes that the actions of importers and exporters, whose transactions are recorded on the current account, induce changes in the exchange rate. Interest rate parity refers to a condition of equality between the rates of return on comparable assets between two countries. The term is somewhat of a misnomer on the basis of how it is being described here, as it should really be called rate of return parity. The term developed in an era when the world was in a system of fixed exchange rates. Under those circumstances, and as will be demonstrated in a later chapter, rate of return parity did mean the equalization of interest rates. However, when exchange rates can fluctuate, interest rate parity becomes rate of return parity, but the name was never changed. One should be careful, however. The approximate version would not be a good approximation when interest rates in a country are high. For example, back in 1997, short-term interest rates were 60 percent per year in Russia and 75 percent per year in Turkey. With these interest rates, the approximate formula would not give an accurate representation of rates of return. Investor behavior in asset markets that results in interest parity can also explain why the exchange rate may rise and fall in response to market changes. In other words, interest parity can be used to develop a model of exchange rate determination. This is known as the asset approach, or the interest rate parity model. The first step is to reinterpret the rate of return calculations described previously in more general (aggregate) terms. Thus instead of using the interest rate on a one-year certificate of deposit (CD), we will interpret the interest rates in the two countries as the average interest rates that currently prevail. Similarly, we will imagine that the expected exchange rate is the average expectation across many different individual investors. The rates of return then are the average expected rates of return on a wide variety of assets between two countries. Next, we imagine that investors trade currencies in the foreign exchange (Forex) market. Each day, some investors come to a market ready to supply a currency in exchange for another, while others come to demand currency in exchange for another. which implies that as E$/£ rises, RoR£ falls. This means that British investors would seek to supply more pounds at higher pound values but U.S. investors would demand fewer pounds at higher pound values. This explains why the supply curve slopes upward and the demand curve slopes downward. 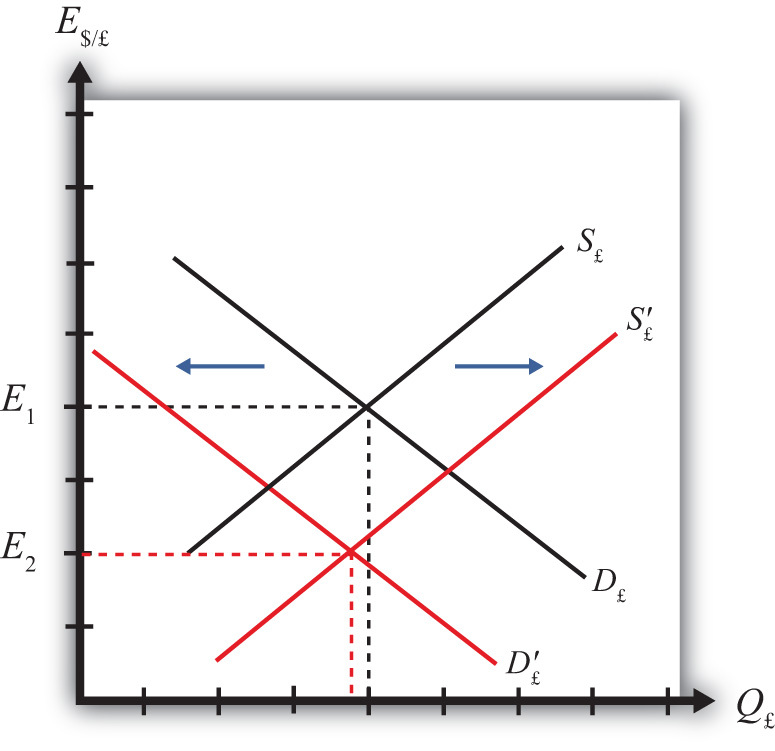 The intersection of supply and demand specifies the equilibrium exchange rate (E1) and the quantity of pounds (Q1) traded in the market. When the Forex is at equilibrium, it must be that interest rate parity is satisfied. This is true because the violation of interest rate parity will cause investors to shift funds from one country to another, thereby causing a change in the exchange rate. This process is described in more detail in Chapter 5 "Interest Rate Parity", Section 5.2 "Comparative Statics in the IRP Theory". Interest rate parity in a floating exchange system means the equalization of rates of return on comparable assets between two different countries. Interest rate parity is satisfied when the foreign exchange market is in equilibrium, or in other words, IRP holds when the supply of currency is equal to the demand in the Forex. This theory of exchange rate determination is also known as the asset approach. The name of the condition in which rates of return on comparable assets in different countries are equal. Of greater, less, or equal, this is how the supply of pounds compares to the demand for pounds in the foreign exchange market when interest rate parity holds. Learn how adjustment to equilibrium is described in the interest rate parity model. Any equilibrium in economics has an associated behavioral story to explain the forces that will move the endogenous variable to the equilibrium value. In the foreign exchange (Forex) model, the endogenous variable is the exchange rate. This is the variable that is determined as a solution in the model and will change to achieve the equilibrium. Variables that do not change in the adjustment to the equilibrium are the exogenous variables. In this model, the exogenous variables are E$/£e, i$, and i£. Changes in the exogenous variables are necessary to cause an adjustment to a new equilibrium. However, in telling an equilibrium story, it is typical to simply assume that the endogenous variable is not at the equilibrium (for some unstated reason) and then explain how and why the variable will adjust to the equilibrium value. Suppose, for some unspecified reason, the exchange rate is currently at E″$/£ as shown in Figure 5.6 "Adjustment When the Exchange Rate Is Too High". The equilibrium exchange rate is at E′$/£ since at this rate, rates of return are equal and interest rate parity (IRP) is satisfied. Thus at E″$/£ the exchange rate is too high. Since the exchange rate, as written, is the value of the pound, we can also say that the pound value is too high relative to the dollar to satisfy IRP. 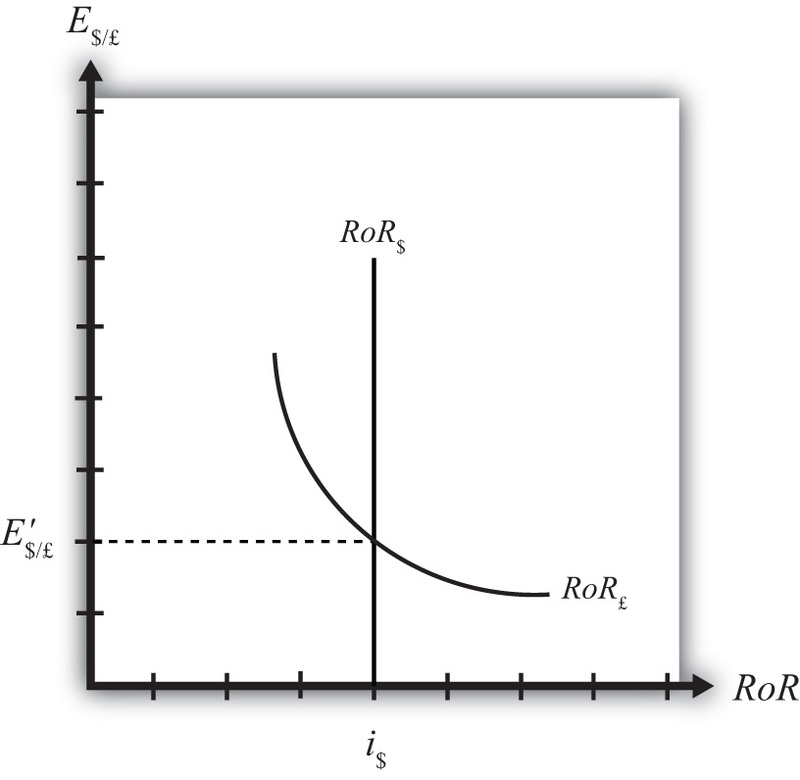 With the exchange rate at E″$/£, the rate of return on the dollar, RoR$, is given by the value A along the horizontal axis. This will be the value of the U.S. interest rate. The rate of return on the pound, RoR£ is given by the value B, however. This means that RoR£ < RoR$ and IRP does not hold. Under this circumstance, higher returns on deposits in the United States will motivate investors to invest funds in the United States rather than Britain. This will raise the supply of pounds on the Forex as British investors seek the higher average return on U.S. assets. It will also lower the demand for British pounds (£) by U.S. investors who decide to invest at home rather than abroad. Both changes in the Forex market will lower the value of the pound and raise the U.S. dollar value, reflected as a reduction in E$/£. In more straightforward terms, when the rate of return on dollar deposits is higher than on British deposits, investors will increase demand for the higher RoR currency and reduce demand for the other. The change in demand on the Forex raises the value of the currency whose RoR was initially higher (the U.S. dollar in this case) and lowers the other currency value (the British pound). As the exchange rate falls from E″$/£ to E′$/£, RoR£ begins to rise up, from B to A. This occurs because RoR£ is negatively related to changes in the exchange rate. Once the exchange rate falls to E′$/£, RoR£ will become equal to RoR$ at A and IRP will hold. At this point there are no further pressures in the Forex for the exchange rate to change, hence the Forex is in equilibrium at E′$/£. 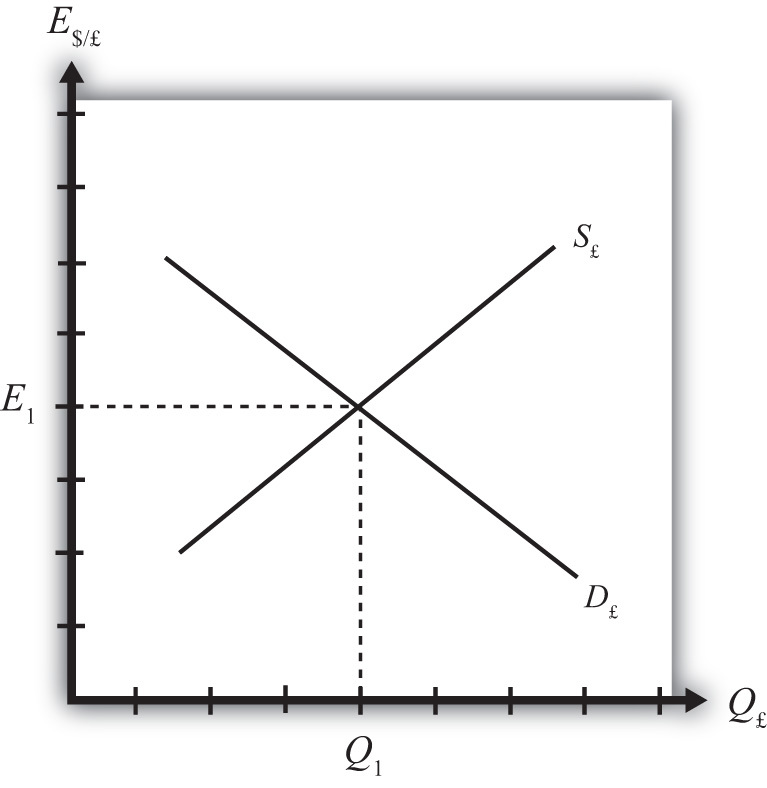 If the exchange rate is lower than the equilibrium rate, then the adjustment will proceed in the opposite direction. At any exchange rate below E′$/£ in the diagram, RoR£ > RoR$. This condition will inspire investors to move their funds to Britain with the higher rate of return. The subsequent increase in the demand for pounds will raise the value of the pound on the Forex and E$/£ will rise (consequently, the dollar value will fall). The exchange rate will continue to rise and the rate of return on pounds will fall until RoR£ = RoR$ (IRP holds again) at E′$/£. In the interest rate parity model, when the $/£ exchange rate is less than the equilibrium rate, the rate of return on British deposits exceeds the RoR on U.S. deposits. That inspires investors to demand more pounds on the Forex to take advantage of the higher RoR. Thus the $/£ exchange rate rises (i.e., the pound appreciates) until the equilibrium is reached when interest rate parity holds. In the interest rate parity model, when the $/£ exchange rate is greater than the equilibrium rate, the rate of return on U.S. deposits exceeds the RoR on British deposits. That inspires investors to demand more U.S. dollars on the Forex to take advantage of the higher RoR. Thus the $/£ exchange rate falls (i.e., the dollar appreciates) until the equilibrium is reached when interest rate parity holds. Of increase, decrease, or stay the same, the expected effect on the exchange rate (E$/£) if the rate of return on pound assets is greater than the rate of return on dollar assets. Of increase, decrease, or stay the same, the expected effect on the exchange rate (E$/£) if the rate of return on U.S. assets is greater than the rate of return on British assets. Of increase, decrease, or stay the same, the expected effect on the value of the dollar if the rate of return on pound assets is greater than the rate of return on dollar assets. Of increase, decrease, or stay the same, the expected effect on the value of the dollar if the rate of return on U.S. assets is greater than the rate of return on British assets. Of increase, decrease, or stay the same, the expected effect on the value of the dollar if the rate of return on U.S. assets is equal to the rate of return on British assets. Learn the effects of changes in the foreign interest rate on the value of the domestic and foreign currency using the interest rate parity model. Suppose that the foreign exchange market (Forex) is initially in equilibrium such that RoR£ = RoR$ (i.e., interest rate parity holds) at an initial equilibrium exchange rate given by E′$/£. 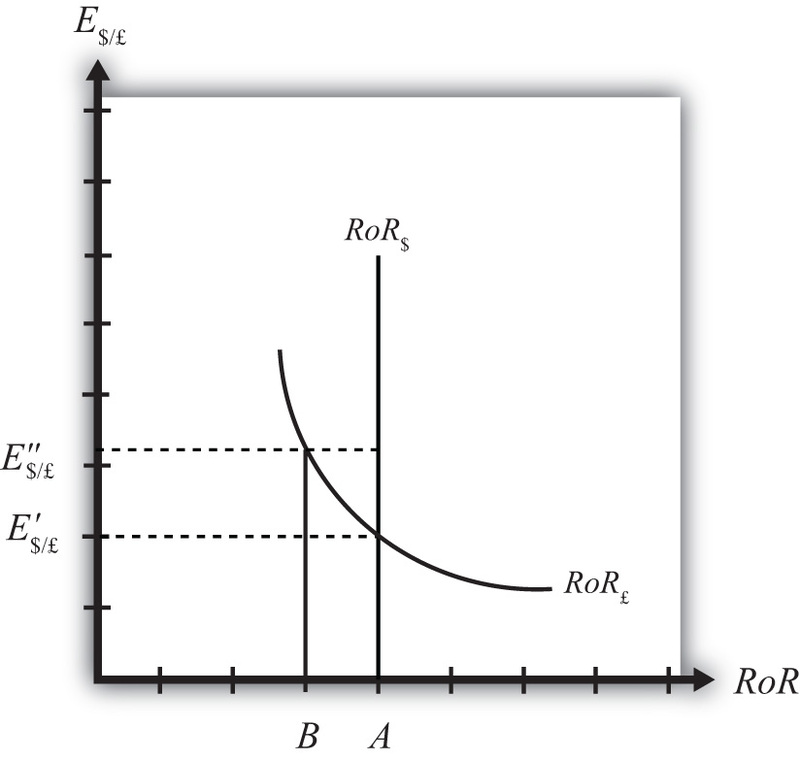 The initial equilibrium is depicted in Figure 5.7 "Effects of a U.S. Interest Rate Increase in a RoR Diagram". Next, suppose U.S. interest rates rise, ceteris paribus. Ceteris paribus means we assume all other exogenous variables remain fixed at their original values. In this model, the British interest rate (i£) and the expected exchange rate (E$/£e) both remain fixed as U.S. interest rates rise. The increase in U.S. interest rates will shift the U.S. RoR line to the right from RoR′$ to RoR″$ as indicated by step 1 in Figure 5.7 "Effects of a U.S. Interest Rate Increase in a RoR Diagram". Immediately after the increase and before the exchange rate changes, RoR$ > RoR£. The adjustment to the new equilibrium will follow the “exchange rate too high” equilibrium story earlier. Accordingly, higher U.S. interest rates will make U.S. dollar investments more attractive to investors, leading to an increase in demand for dollars on the Forex resulting in an appreciation of the dollar, a depreciation of the pound, and a decrease in E$/£. The exchange rate will fall to the new equilibrium rate E″$/£ as indicated by step 2 in the figure. In summary, an increase in the U.S. interest rate will raise the rate of return on dollars above the rate of return on pounds, lead investors to shift investments to U.S. assets, and result in a decrease in the $/£ exchange rate (i.e., an appreciation of the U.S. dollar and a depreciation of the British pound). In contrast, a decrease in U.S. interest rates will lower the rate of return on dollars below the rate of return on pounds, lead investors to shift investments to British assets, and result in an increase in the $/£ exchange rate (i.e., a depreciation of the U.S. dollar and an appreciation of the British pound). An increase in U.S. interest rates will result in a decrease in the $/£ exchange rate (i.e., an appreciation of the U.S. dollar and a depreciation of the British pound). A decrease in U.S. interest rates will result in an increase in the $/£ exchange rate (i.e., a depreciation of the U.S. dollar and an appreciation of the British pound). Suppose that the foreign exchange market (Forex) is initially in equilibrium such that RoR£ = RoR$ (i.e., interest rate parity holds) at an initial equilibrium exchange rate given by E′$/£. 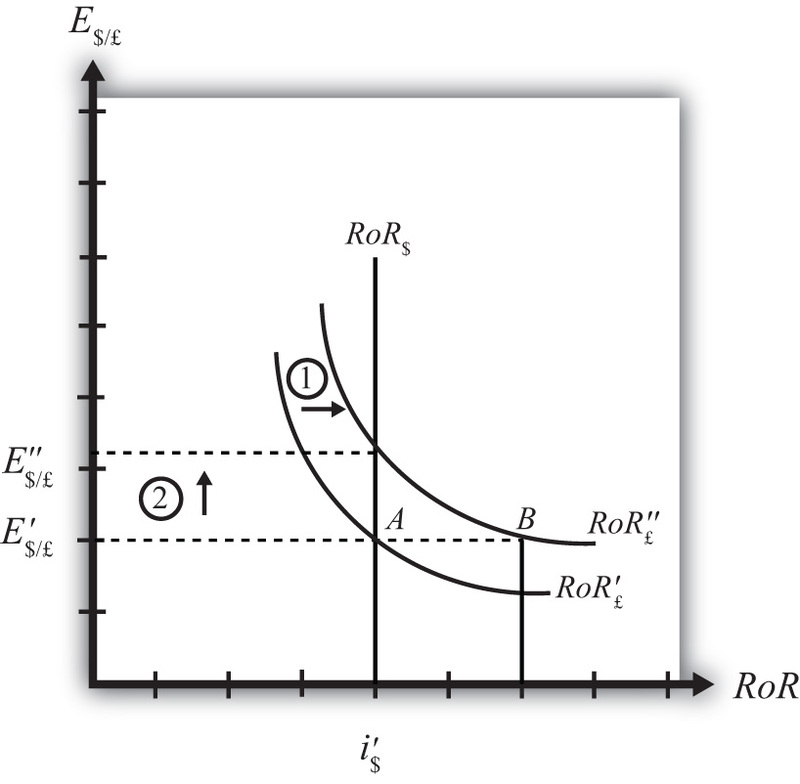 The initial equilibrium is depicted in Figure 5.8 "Effects of a British Interest Rate Increase in a RoR Diagram". Next, suppose British interest rates rise, ceteris paribus. Ceteris paribus means we assume all other exogenous variables remain fixed at their original values. In this model, the U.S. interest rate (i$) and the expected exchange rate (E$/£e) both remain fixed as British interest rates rise. The increase in British interest rates (i£) will shift the British RoR line to the right from RoR′£ to RoR″£ as indicated by step 1 in the figure. Suppose one is at the original equilibrium with exchange rate E′$/£. Looking at the formula, an increase in i£ clearly raises the value of RoR£ for any fixed values of E$/£e. This could be represented as a shift to the right on the diagram, as from A to B. Once at B with a new interest rate, one could perform the exercise used to plot out the downward sloping RoR curve (see Chapter 5 "Interest Rate Parity", Section 5.3 "Forex Equilibrium with the Rate of Return Diagram"). The result would be a curve, like the original, but shifted entirely to the right. Immediately after the increase and before the exchange rate changes, RoR£ > RoR$. The adjustment to the new equilibrium will follow the “exchange rate too low” equilibrium story presented in Chapter 5 "Interest Rate Parity", Section 5.4 "Exchange Rate Equilibrium Stories with the RoR Diagram". Accordingly, higher British interest rates will make British pound investments more attractive to investors, leading to an increase in demand for pounds on the Forex, and resulting in an appreciation of the pound, a depreciation of the dollar, and an increase in E$/£. The exchange rate will rise to the new equilibrium rate E″$/£ as indicated by step 2. In summary, an increase in British interest rates will raise the rate of return on pounds above the rate of return on dollars, lead investors to shift investments to British assets, and result in an increase in the $/£ exchange rate (i.e., an appreciation of the British pound and a depreciation of the U.S. dollar). In contrast, a decrease in British interest rates will lower the rate of return on British pounds below the rate of return on dollars, lead investors to shift investments to U.S. assets, and result in a decrease in the $/£ exchange rate (i.e., a depreciation of the British pound and an appreciation of the U.S. dollar. An increase in British interest rates will result in an increase in the $/£ exchange rate (i.e., an appreciation of the British pound and a depreciation of the U.S. dollar). A decrease in British interest rates will result in a decrease in the $/£ exchange rate (i.e., a depreciation of the British pound and an appreciation of the U.S. dollar). Learn the effects of changes in the expected future currency value on the spot value of the domestic and foreign currency using the interest rate parity model. Suppose that the foreign exchange market (Forex) is initially in equilibrium such that RoR£ = RoR$ (i.e., interest rate parity holds) at an initial equilibrium exchange rate given by E′$/£. 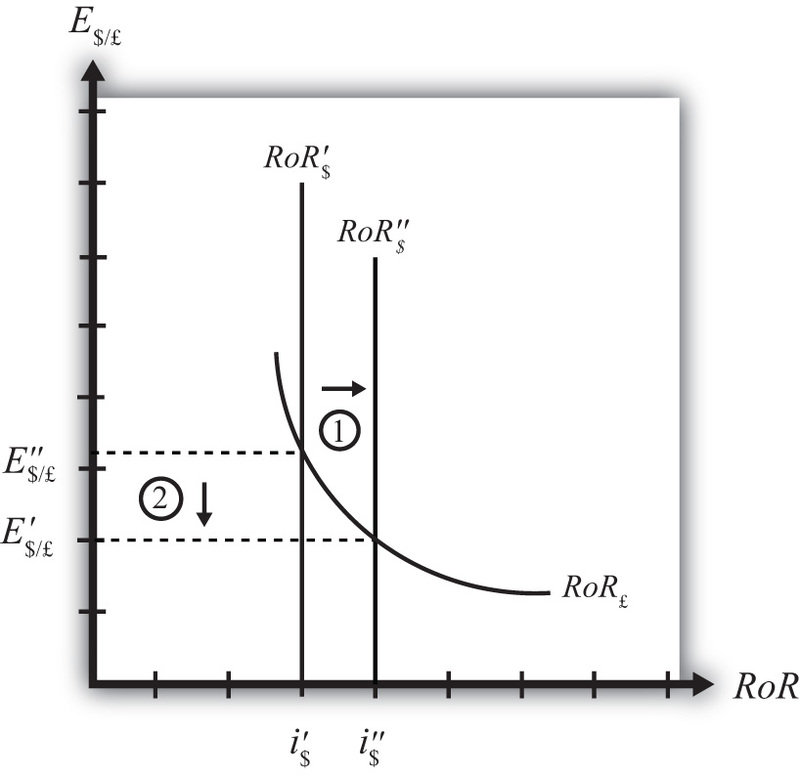 The initial equilibrium is depicted in Figure 5.9 "Effects of an Expected Exchange Rate Change in a RoR Diagram". Next, suppose investors’ beliefs shift so that E$/£e rises, ceteris paribus. Ceteris paribus means we assume all other exogenous variables remain fixed at their original values. In this model, the U.S. interest rate (i$) and the British interest rate (i£) both remain fixed as the expected exchange rate rises. An expected exchange rate increase means that if investors had expected the pound to appreciate, they now expect it to appreciate even more. Likewise, if investors had expected the dollar to depreciate, they now expect it to depreciate more. Alternatively, if they had expected the pound to depreciate, they now expect it to depreciate less. Likewise, if they had expected the dollar to appreciate, they now expect it to appreciate less. The increase in the expected exchange rate (E$/£e) will shift the British RoR line to the right from RoR′£ to RoR″£ as indicated by step 1 in the figure. Suppose one is at the original equilibrium with exchange rate E′$/£. Looking at the formula, an increase in E$/£e clearly raises the value of RoR£ for any fixed values of i£. This could be represented as a shift to the right on the diagram from A to B. Once at B with a new expected exchange rate, one could perform the exercise used to plot out the downward sloping RoR curve. The result would be a curve, like the original, but shifted entirely to the right. Immediately after the increase and before the exchange rate changes, RoR£ > RoR$. The adjustment to the new equilibrium will follow the “exchange rate too low” equilibrium story presented in Chapter 5 "Interest Rate Parity", Section 5.4 "Exchange Rate Equilibrium Stories with the RoR Diagram". Accordingly, higher expected British rates of return will make British pound investments more attractive to investors, leading to an increase in demand for pounds on the Forex and resulting in an appreciation of the pound, a depreciation of the dollar, and an increase in E$/£. The exchange rate will rise to the new equilibrium rate E″$/£ as indicated by step 2. In summary, an increase in the expected future $/£ exchange rate will raise the rate of return on pounds above the rate of return on dollars, lead investors to shift investments to British assets, and result in an increase in the $/£ exchange rate (i.e., an appreciation of the British pound and a depreciation of the U.S. dollar). In contrast, a decrease in the expected future $/£ exchange rate will lower the rate of return on British pounds below the rate of return on dollars, lead investors to shift investments to U.S. assets, and result in a decrease in the $/£ exchange rate (i.e., a depreciation of the British pound and an appreciation of the U.S. dollar). An increase in the expected future pound value (with respect to the U.S. dollar) will result in an increase in the spot $/£ exchange rate (i.e., an appreciation of the British pound and a depreciation of the U.S. dollar). A decrease in the expected future pound value (with respect to the U.S. dollar) will result in a decrease in the spot $/£ exchange rate (i.e., a depreciation of the British pound and an appreciation of the U.S. dollar).